Solitaire City Game - Download and Play Free Version! 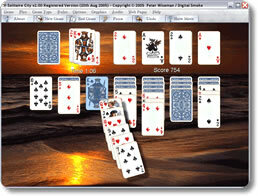 Play Over a Dozen Variations of Solitaire! 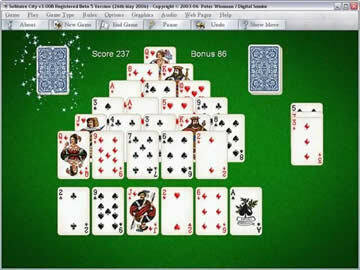 One of the most popular ways to pass time is to play a quick game of solitaire. The rules are simple to learn, it exercises one’s observational skills, it can be strangely addictive, and it’s found on just about every single computer out there. Unfortunately, plain old solitaire can also get really boring after a while. Luckily for you, there are many different variations of solitaire out there. They may not be installed on every computer, but you can easily get your hands on them with Solitaire City. Solitaire City could not have a more appropriate name. With this package, you’ll get a wide variety of single-player card games to choose from, including Klondike solitaire, the classic variation of which we all know about. With this collection on hand, you’ll never find yourself in a gaming rut ever again. Play over a dozen solitaire card games, including demon, tri-peak, poker squares, spider, spiderette, Yukon, and eliminator! Set different rules for every single game! Determine how many times you can re-deal the cards, cycle through the stock, and more. Beat the high scores. Play fast and effectively to earn more points. Are you concerned about how troublesome it could be to learn how to play all the new games? Don’t fret! Solitaire City includes a number of helping hands that will make your learning experience as simple a process as possible! Includes an extensive help guide and glossary that covers every term and aspect of solitaire. Play through training mode to get a feel for each game. Follow concise instructions and clear directions that indicate what cards can be play and where you can play them. Do you find looking at a drab green background to be kind of bland? Would you like your cards to have a little more personality? 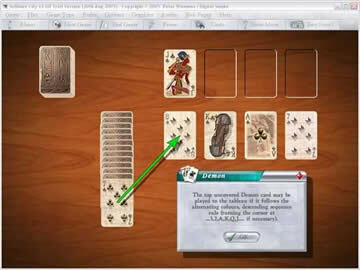 Do you like to listen to any particular music whilst playing solitaire? Solitaire City will cover you on all fronts by offering an incredible array of options to personalize your solitaire-playing experience. Change the background using what’s available in-game, or create your own. Put together your own music playlists and plug them into Solitaire City for easy listening. Play cards in five sizes fit for different monitors and visual ranges: small, medium, large, jumbo and king-sized. Choose from a dozen card themes, or download countless others online at no extra cost! If you’re in the market for a compilation of games with a shiny coat of polish, then consider giving Solitaire City a look. With endless replay value, extensive customization and in-depth help, it has everything a solitaire enthusiast could want.